It's that time of year again! The spring grass is starting to come through, and up and down the country horse owners are seeing their once-placid horses become altogether different beasts. Take a look at any of the many online horse forums, and you'll see the same complaints occurring time and time again at this time of year: "My horse has become unrideable", "Why is my horse behaving so badly all of a sudden? ", "Help, I'm starting to become scared of riding or handling my horse". There are all sorts of theories about why spring grass has such a powerful effect on so many horses. Some people maintain that there is an excess of sugars present in the grass at this time of year, while others claim that raised levels of potassium in grass at this time of year are to blame. High levels of potassium could certainly be the main culprit, as processing this mineral causes a depletion in the horse's magnesium levels, which quickly translates into undesirable behaviour. For some horse owners unwanted behaviours occur throughout the year, and once again, a depletion of magnesium levels appears to be the principal cause of these behavioural traits, with mares appearing to be particularly susceptible (although some geldings and stallions are also affected). Equine nutritionists believe that the importance of adequate levels of magnesium in the horse's diet is not sufficiently acknowledged by horse owners. Studies show that a deficiency of magnesium in the horse's diet can have a profound effect on even the most well-behaved equine, although interestingly, not all horses seem to be affected to the same degree. In many cases, supplementing the horse's diet with magnesium can have a profound calming effect, with owners reporting an almost magical improvement in behaviour within days of commencing supplementation. Adding a magnesium supplement to your horse's feed, whether on a temporary basis to combat the effects of spring grass, or throughout the year for those horses who require it, would appear to be a no-brainer. It's important to note, however, that all not supplements can produce the same effects. This is due to the fact that magnesium can be bought in many forms. One cheap type of the mineral is known as magnesium sulphate, which is actually another name for Epsom salts! That's not exactly a high-quality ingredient, yet some equine calmers choose to use this option rather than a more readily absorbed alternative. Magnesium oxide is another popular ingredient often used by feed supplement companies, but again, this is not particularly effective once it enters the horse's digestive system. Equine Answers takes an altogether different approach. 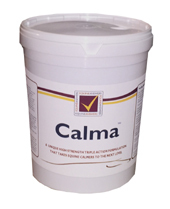 By using more effective types of magnesium with greater bio-availability to the equine, our Calma product ensures that the horse is able to access this important mineral quickly and efficiently. We only use Magnesium Aspartate HCL and Magnesium AAC, which have been proven to give much better results than other calmers on the market. These forms of magnesium are more expensive, but equally they are more effective, particularly when combined with a carefully-chosen selection of herbs that boost the mineral's effects. Yet we still manage to keep our Calma supplement affordable, so that every horse owner who needs this important mineral in their horse's diet can enjoy its benefits. What is Mud Fever and How to Treat it?